What is anterior cruciate ligament (ACL) injury? 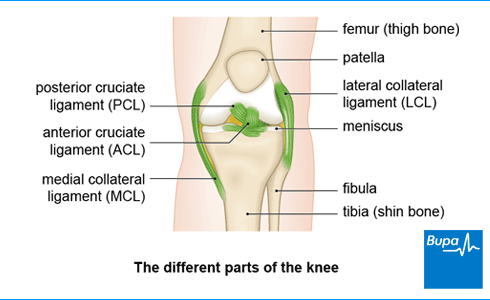 Your anterior cruciate ligament (ACL) is one of the ligaments inside your knee. It gets its name from the fact that it passes in front of another ligament, the posterior cruciate ligament (PCL), forming a cross shape. Your ACL connects your thigh bone (femur) to the front of your shin bone (tibia). Along with the other ligaments in your knee, it keeps your knee stable and prevents your thigh and shin bones moving out of place. An ACL injury can be a partial or a complete tear, an overstretch, or a detachment of the ligament. Knee ligament injuries are also referred to as a sprain. They’re given different grades depending on how severe an injury it is. Around half of all people with an ACL injury will have injuries to other parts of their knee as well, such as a meniscus tear. You’re more likely to injure your ACL if you take part in sports, especially football, basketball and skiing. Symptoms: what are the signs? At the time of injury to your anterior cruciate ligament (ACL) you may hear a popping sound and feel pain in your knee. Your knee may feel unstable, and you may not be able to bear weight on it. If you’re playing sport you’re unlikely to be able to carry on. You will quickly develop swelling around your knee joint within a few hours of injuring it. You may lose the full range of movement in your knee. Causes: why has this happened? If you’re playing contact sports your ACL may also be injured during direct contact or collision with another player. You’ll usually need to go to A&E with this kind of injury. You may then be referred to an acute knee clinic, which will organise any investigations and treatment you need. The treatment you’re offered for your anterior cruciate ligament (ACL) injury will depend on how severe the damage is and how active you normally are. The initial treatment will be to control your pain and swelling using the PRICE and HARM self help measures. Details of these can be found on the next tab. Further treatments include physiotherapy, medicines and surgery. You may see an orthopaedic surgeon (a doctor who specialises in bone surgery) or a sports medicine professional, such as a sports doctor or physiotherapist. A physiotherapist is a health professional who specialises in maintaining and improving movement and function. There are different treatments that your doctor or physiotherapist may suggest, and a lot that you can do yourself to help your recovery. At first you should follow the PRICE procedure to manage any type of soft tissue injury to your knee. PRICE stands for Protection, Rest, Ice, Compression and Elevation. There are certain things you should not do in the first three days after your injury so you don’t damage your knee further. These can be remembered as HARM, which stands for Heat, Alcohol, Running and Massage. If you’re having difficulty bearing weight on your knee, you may need to use crutches or wear a brace to support you for a while. Making sure you follow any physiotherapy and rehabilitation programme you’re given will be an important part of your recovery. The aim of physiotherapy is to help your knee recover its full range of movement, its strength and stability, and return to normal function. Your physiotherapist will carefully assess your knee and then plan a programme of rehabilitation exercises to suit your individual needs. The physiotherapy programme will be designed to give you the best chance of returning to your usual activity. You can take over-the-counter painkillers, such as paracetamol or ibuprofen, to treat mild to moderate pain. Your doctor may be able to prescribe you stronger painkillers if your pain is severe. As well as easing your pain, non-steroidal anti-inflammatory drugs (NSAIDs) such as ibuprofen may help to reduce inflammation and swelling. Always read the patient information that comes with your medicine, and if you have questions ask your pharmacist or GP for advice. Some people still prefer to give rehabilitation with physiotherapy a try first. Either way, your doctor probably won’t recommend that you have surgery right away after your injury. It’s usually best to wait at least one or two weeks, to allow the swelling in your knee to reduce first. It usually takes between six and 12 months for you to return to full activity after surgery. And you’ll need to be prepared to undergo an intense and lengthy period of physiotherapy after your operation. Ask your doctor about the pros and cons of surgery, and how it might help in your own circumstances. Assess your knee function and pain, and find out about common knee injuries and their symptoms. Find the treatment and care that is best suited to your individual needs and preferences. Prevent knee injuries and stop them from returning by loving your knees.